SAVE1894, originally uploaded by bucklesw1. its 20th season, starting in January. Fla., 30 minutes outside Sarasota. on the road. At heart, Freida is a circus lifer. It's in the blood. Her father was Fred Logan. Aside from the two years he served in the U.S.
railways, died when Fred was 10.
at the start, making $3 a week. He didn¹t care, said Freida. He loved the road, loved the life. had an ivory touch with the elephants. My mother always used to say to him: You're married to the elephants. Freida said. I say the same thing to my husband now. 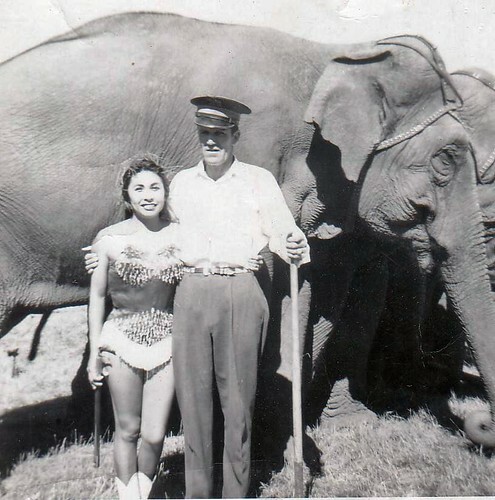 Freida's husband, Jorge, is also from a circus family, hailing from Cuba. globe and helps with the show's music and lighting. In a family circus, everybody does everything, Freida said. worked for in the ¹40s. Vicenta¹s act features six white tigers. Yellow Eyes, performed in wild west shows. town along the way, they helped with the circus set-up and takedown. there. He'd work with the cats. He'd do a parade in town and put up banners. acts. Then he and mother did the elephant act. I miss those days, Eileen said, but I don't miss the travel. Eileen is a bank manager in Las Vegas, but is still connected to the circus. and their daughter, Candice, both tour with Circo Osorio, based in Vegas. have to do anything, I just stood there. the time and tell me stories about him. It's hard coming home now, with him not here, Freida said. granddaughter Vicenta perform with Ringling Bros.
Reading this article made me stop and think about my own career. Now, I was an aerialist and acrobat, not an animal person at all. I never knew Captain Logan personally but was the recipient of his hospitality on an occasion or two on the lot of the CBCB show over the years. He was a gracious host and generous to us visitors. This got me thinking about how many of the greats that helped out this town boy or "gadjo" along the way and over the years came from the ranks of the animal world. Buckles, Ben, Rex, John H., Roy, Wade, Tommy, Charly, Gunther, and so many more. Must be something about that world of unconditional love and respect that drives the animal world that also leads them to help the rest of us as well. Captain Logan was a great friend. I'm so glad I get to sit down with him and talk about his circus life. I miss a great friend.